Krishna Kumar is struggling to find labourers for his dairy project in Bihar 's Vaishali district. The work culture of the region has worsened drastically over the past few years, he complains. Why? "People have taken to excessive drinking," he says, blaming the state government for the problem. "Until 2006, there was only one liquor shop for 16 panchayats in the vicinity. Now, there are five. The state government has made liquor easily accessible." Liquor shops have sprouted not just in Vaishali district but across the state. The number of liquor vends allotted by the state government climbed to 5,467 in 2012/13 from 3,436 in 2006/07, according to official data. The jump was highest in rural areas, where the number of shops tripled to 2,360 from 779 during the same period. Liquor sales surged at a much faster pace. Consumption of country liquor quadrupled while that of India-made foreign liquor (IMFL) increased almost five times and beer sales soared more than 11 times. No wonder, then, that Bihar's excise revenue has jumped to Rs 2,765 crore in 2012/13 from Rs 525 crore in 2007/08. The 40 per cent annualised growth has made excise tax the fastest-growing segment in the state's revenue kitty. 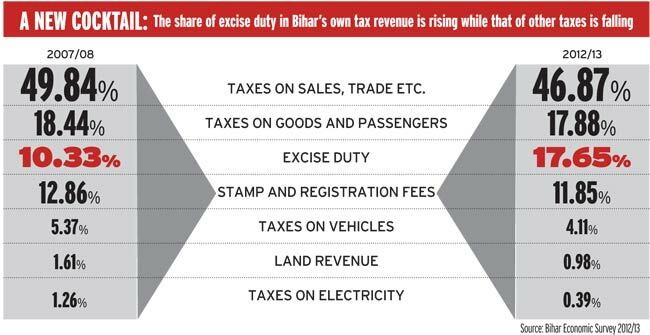 The share of excise duty in Bihar's own tax revenue has risen to 17.65 per cent in 2012/13 from 10.33 per cent five years before. On the other hand, the share of other components such as sales tax slipped during the period. So, what explains this trend? 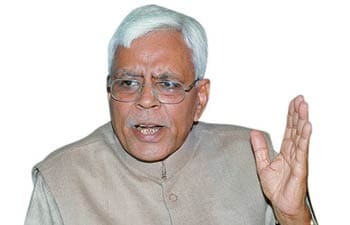 The state government changed its excise policy after Nitish Kumar became chief minister in 2005 as the head of an alliance between Janata Dal (United) and the Bharatiya Janata Party (BJP). It started allotting more liquor shops and began increasing licence fees in a bid to boost revenue. The growing importance of excise duty for Bihar, one of India's least industrialised states, is in contrast to Haryana, a more industrialised state where liquor consumption is also high. The contribution of excise duty to Haryana's own tax revenue was 13.32 per cent in 2011/12, only marginally higher from 12.19 per cent in 2005/06. But the share of sales tax jumped to 67.09 per cent from 61.73 per cent during the same period. Emails and phone calls to the offices of Sandeep Poundrik, Secretary, Excise and Prohibition Department, and Excise Commissioner Syed Parvez Alam seeking comment on Bihar's excise policy elicited no response. 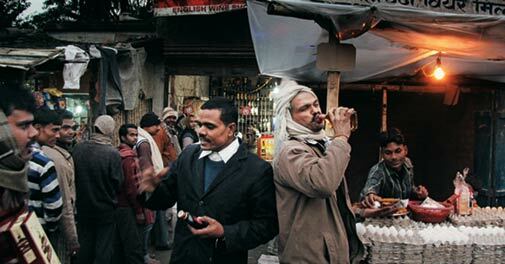 Shivanand Tiwari, General Secretary, JD (U), agrees that liquor consumption in the state has shot up. "On festivals such as Holi people are consuming more alcohol instead of traditional favourites bhaang and gaanja," he says. But he defends the excise policy. He says that before 2005, 80 per cent of the liquor business was outside the revenue net. "The increase in revenue is a result of organising the liquor trade," he says. BJP leader Sushil Kumar Modi, who was the state's deputy chief minister until his party's alliance with the JD (U) ended last year, concurs. "The rise is on account of structural changes that were introduced post 2005 with a uniform excise tax structure," he says. The state now allots licences for liquor shops through a lottery. A single licence is not granted. Depending on the area, it could allot licences for two or three shops in a group mandated to sell IMFL or country liquor. In some cases, shops in rural and municipal areas are tagged together. The licence fee is substantial. A liquor vendor from Buxar says he pays Rs 8.45 lakh a month as licence fee for his three shops, two of country liquor and one of IMFL. A Muzaffarpur-based restaurateur, who does not wish to be named, says he shelved plans to open a bar in his restaurant after the state increased the annual licence fee for bars from Rs 5 lakh to Rs 17 lakh in April 2013. "In addition to paying several taxes for the restaurant, I will not be able to generate enough sales to offset this hike," he says. The restaurateur says that, based on his interactions with excise department officials, he feels the decision to increase the bar fee manifold is aimed at shifting consumers from bars to liquor vends. "An individual consumes a couple of pegs in a bar, whereas he would buy at least a bottle from a shop. Sales are limited in a bar and so they are not generating as much revenue." The government has also raised the minimum guaranteed quantity that vendors must procure from the state. Vendors' total monthly quota for IMFL has been raised to 3.91 million London proof litres (LPL) in 2013/14 from 2.90 million LPL the previous year. 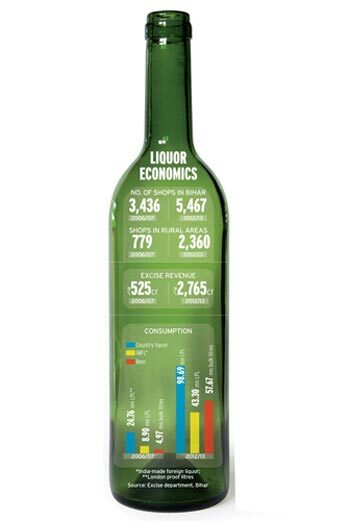 For country and spiced country liquor, the quota has been increased to 9.25 million LPL from 7.71 million LPL. Similarly, for beer the quota has been raised to 6 million bulk litres from 4 million bulk litres. LPL and bulk litres are units of alcohol measurement. Vendors say the rise in licence fee and quotas is making it difficult for them to operate. The fee increase also explains why 315 of the 5,467 liquor shops allotted in 2012/13 were not allotted. A vendor from Muzaffarpur says that competition among vendors is growing and many are encouraging credit or selling liquor at lower prices to attract consumers. While growing liquor sales may have boosted the treasury, the state is facing heavy criticism from social activists and academics. Critics say a revenue model that promotes liquor sales has a huge social cost on health and status of women in a state where much of society is still feudal-minded. Vaishali dairy entrepreneur Kumar says there are few jobs for skilled or semi-skilled youth because no big or small-scale industry has been set up due to lack of political will, bureaucratic lethargy and corruption. "This has led to growing frustration among the youth, especially in rural areas, who do not wish to till land or do manual work. Many of these people connive with village administration to siphon off money from welfare schemes and blow it up on liquor," he says. Sanjay Kumar, a social activist in Jehanabad, says alcohol consumption in rural areas is rising because of "freebies". He cites the example of a household below the poverty line, which gets 15 kg rice and 25 kg wheat for Rs 155 a month. Even a man who works for five to 10 days a month and earns Rs 100-120 a day spends a large amount on liquor, he adds. Kanhiya Singh, Senior Fellow at the New Delhi-based think tank National Council of Applied Economic Research (NCAER), says high excise duty and licence fee could lead to adulteration and a thriving black market, especially for country liquor. Shiv Prakash Rai, a social activist from Buxar, says while the government is giving the impression that it is dissuading people from consuming more by increasing licence fees and liquor prices, it is also issuing more licences than before. "Clearly, one has to read between the lines," he says. Some experts feel excise revenue should be seen only as a necessary evil and there is nothing wrong if a state taxes liquor heavily. "The state needed internal revenue and excise happens to be an area where it could enhance rates and expand the revenue base," says Shaibal Gupta, Member-Secretary of the Patna-based Asian Development Research Institute. But some others question the tax structure in which excise revenue is registering maximum growth. Pronab Sen, former chief statistician of India, feels the seven percentage point rise in the share of excise duty in total revenue is very high. "It can be worrying for any state, as excise has a limited role and scope," he says. Digambar Mishra Diwakar, Director, A.N. Sinha Institute of Social Studies, Patna, says industry in Bihar is not developing due to lack of basic infrastructure, with electricity shortage being the biggest hurdle. "For industry to grow, confidence building measures are still amiss," he says. Official data back this opinion. The State Investment Promotion Board has 1,441 approved projects, of which only 191 have been established or have some kind of existing unit. Singh of NCAER adds that rising excise revenue does not reflect real economic growth. Nawal Kishore Chaudhary, Professor and Dean, Faculty of Social Sciences, Patna University, concurs. "It is not a healthy model for growth and is not sustainable," he says. "Real growth should come from manufacturing, which is not happening in Bihar." Will new launches at Auto Expo help boost auto sales?